Spread some Springtime happiness with this delightful assortment of dipped delights. 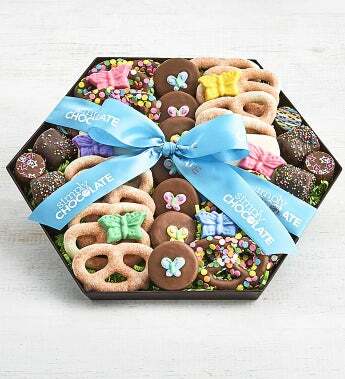 Enjoy chocolate covered pretzels, graham crackers, OREO® cookies and marshmallows in an assortment of Belgian milk, dark, and white chocolate. This tray will sweeten any celebration. It's a most appreciated gift and centerpiece for any party.